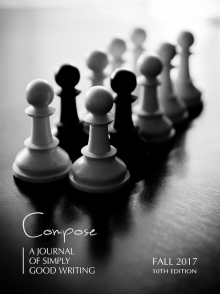 Compose: A Journal of Simply Good Writing is a digital publication dedicated to featuring work by both established and emerging writers of fiction, poetry, and nonfiction. SShort Story Short Story 1,000 - 4,500 words. ZNarrative Nonfiction Narrative Nonfiction Up to 4,500 words. XBook Excerpt Book Excerpt No specific word count limits known.